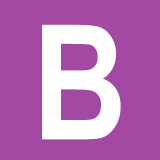 Moving-iron instruments are generally used to measure alternating voltages and currents. In moving-iron instruments the movable system consists of one or more pieces of specially-shaped soft iron, which are so pivoted as to be acted upon by the magnetic field produced by the current in coil. Moving element: a small piece of soft iron in the form of a vane or rod. Coil: to produce the magnetic field due to current flowing through it and also to magnetize the iron pieces. In repulsion type, a fixed vane or rod is also used and magnetized with the same polarity. Control torque is provided by spring or weight (gravity). Damping torque is normally pneumatic, the damping device consisting of an air chamber and a moving vane attached to the instrument spindle. Deflecting torque produces a movement on an aluminum pointer over a graduated scale. 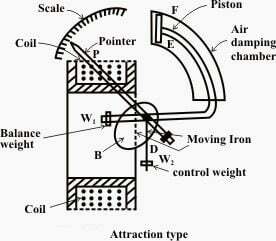 The deflecting torque in any moving-iron instrument is due to forces on a small piece of magnetically ‘soft’ iron that is magnetized by a coil carrying the operating current. 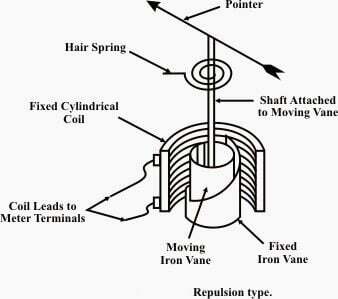 In repulsion type moving–iron instrument consists of two cylindrical soft iron vanes mounted within a fixed current-carrying coil. One iron vane is held fixed to the coil frame and other is free to rotate, carrying with it the pointer shaft. Two irons lie in the magnetic field produced by the coil that consists of only few turns if the instrument is an ammeter or of many turns if the instrument is a voltmeter. Current in the coil induces both vanes to become magnetized and repulsion between the similarly magnetized vanes produces a proportional rotation. The deflecting torque is proportional to the square of the current in the coil, making the instrument reading is a true ‘RMS’ quantity Rotation is opposed by a hairspring that produces the restoring torque. Only the fixed coil carries load current, and it is constructed so as to withstand high transient current. Moving iron instruments having scales that are nonlinear and somewhat crowded in the lower range of calibration. Moving iron instruments are used as Voltmeter and Ammeter only. Both can work on AC as well as on DC. Instrument used to measure current in the circuit. Always connected in series with the circuit and carries the current to be measured. This current flowing through the coil produces the desired deflecting torque. It should have low resistance as it is to be connected in series. Instrument used to measure voltage between two points in a circuit. Current flowing through the operating coil of the meter produces deflecting torque. It should have high resistance. Thus a high resistance of order of kilo ohms is connected in series with the coil of the instrument. For a given moving-iron instrument the ampere-turns necessary to produce full-scale deflection are constant. 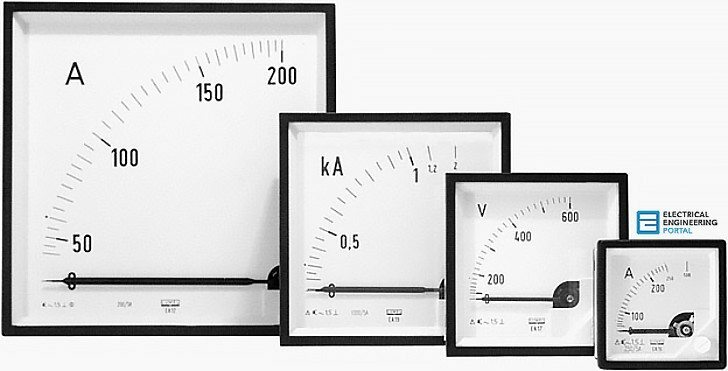 One can alter the range of ammeters by providing a shunt coil with the moving coil. 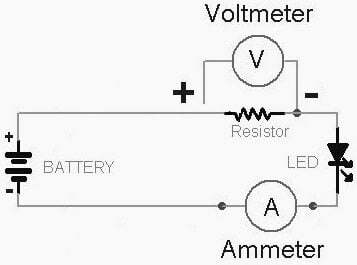 Voltmeter range may be altered connecting a resistance in series with the coil. Hence the same coil winding specification may be employed for a number of ranges. The instruments are suitable for use in AC and DC circuits. The instruments are robust, owing to the simple construction of the moving parts. The stationary parts of the instruments are also simple. Instrument is low cost compared to moving coil instrument. Torque/weight ratio is high, thus less frictional error. Error due to variation in temperature. Error due to friction is quite small as torque-weight ratio is high in moving coil instruments. Stray fields cause relatively low values of magnetizing force produced by the coil. Efficient magnetic screening is essential to reduce this effect. Error due to variation of frequency causes change of reactance of the coil and also changes the eddy currents induced in neighbouring metal. Deflecting torque is not exactly proportional to the square of the current due to non-linear characteristics of iron material. In industry we are using 50 Hz meter ” like ammeter or voltmeter “. When we connect same meter to VFD output and calculate the output power is not match with the output power displayed on VFD screen. WHY?? he meter is calibrated for sine wave AC. VFD produces a non pure sine wave output and the meter’s response is different for any non sine wave input. My guess would be that the errors are greater at low output currents, since VFD outputs can get pretty spiky at low current. Why power consumption of this type of instrument is high? I have a voltage stabilizer and there is an AC Analog Voltmeter. This Voltmeter displays the voltage after pressing a push switch installed on the stabilizer front panel. I want to make this voltmeter to show the voltage rating all the time. Is it possible? I tried to join the wires connected to the push switch and the voltmeter was showing the voltage all the time but after 4 or 5 minutes, the wire wound resistance connected between the two connectors of the voltmeter was getting heated extremely. Thats why I reconnected the wires back to the push switch. But there must be a way by which I can make the voltmeter to show the voltage rating all the time. Please guide me how?? the series resistance does not have a high enough watt rating for cool operation under continuous duty. measure resistance of series resistor and replace with equivalent higher wattage resistor. if you can measure voltage drop across existing resistor and can calculate the current flowing through it you can calculate the required wattage. I recommend double the calculated watt rating for cool operatuion under continuous duty. why the moving iron meters have nonlinear scale? They are analog type instruments,they depend on variations of shunt resistors. I=3, I^2=9…. and so on.